LANSING, Mich. — Sen. Jim Runestad on Monday presented a special tribute to the Milford Village Council congratulating the village on its 150th anniversary. 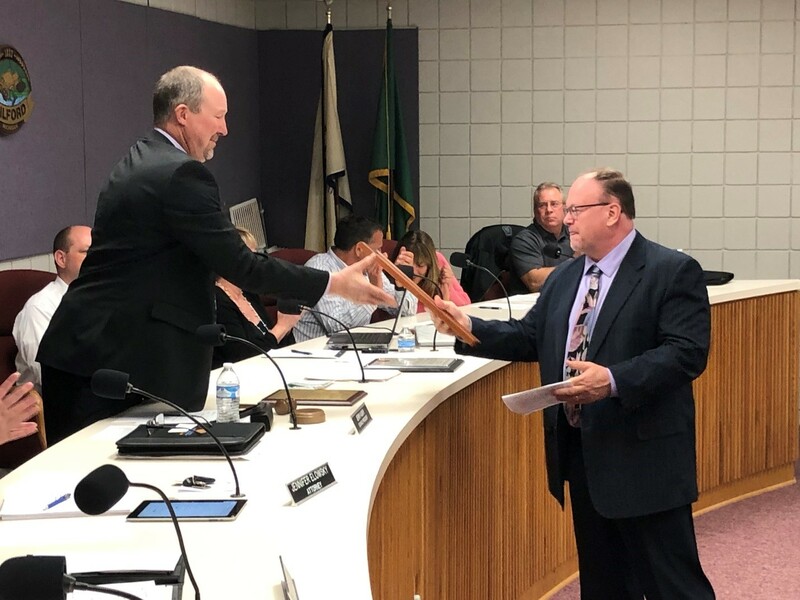 Runestad presented the council with a tribute that highlighted many of the factors that continue to make Milford an attractive place to live and work, such as its six parks, outstanding schools, historic downtown, and small-town charm. The tribute was signed by Runestad; Rep. Matt Maddock, R-Milford; and Gov. Gretchen Whitmer. Editor’s note: The above photograph is available by clicking on the image or by visiting www.SenatorJimRunestad.com/photos. Photo caption: Sen. Jim Runestad R-White Lake, (right), presented a special tribute to Milford Village Council President Jerry Aubry congratulating the village on its 150th anniversary. The tribute was signed by Runestad; Rep. Matt Maddock, R-Milford; and Gov. Gretchen Whitmer.